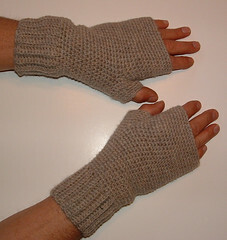 Now that Christmas is over, I can share my men’s fingerless gloves. I crocheted these for my dh out of wool. He saw my fingerless gloves and said he would like a pair so I whipped these up for him. I used one Patons Classic Wool skeins of yarn in the natural mix color. This yarn is a medium weight or ww yarn. 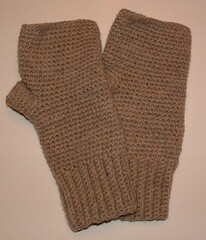 Because of this, you can use my free pattern with any type of medium weight yarn for these gloves. You can be creative and use reclaimed yarn or even acrylic yarn if you’d like to crochet these fingerless gloves. Here is a shot of the gloves being modeled. And another taken laying flat. Click on any of the photos to super size them. Measurements: 9-1/2 inches long, 3-3/4 inches wide at cuff & 4-1/4 inches across at palm. The length of the ribbing cuff is nearly 4″. Adjust this should you need a smaller cuff by working a few less rows for a tighter cuff. Using the long tail from the beginning row, weave closed the cuff by joining row 1 to row 34. Tip: I found it looks best if I work in the BLO of row 34 and both loops of the row 1 when I stitch the cuff closed. This keeps the appearance of the back loop raised stitching look for the cuff. Slip the F hook back into last st of row 34. Now working into both loops, Sc evenly along end sts of cuff. (Approx. 35 Sc) Don’t join at end of round but just continue working in the round without joining or turning as you work the body of the glove. Ch 10, sk 6 sts, and Sc in ea st around back to the chain for the thumb. Sc around the chain for the thumb evenly (approx 10 sts) and Sc in ea remaining st of rnd. Tip: I worked the last several rounds very tightly so the finger opening was snugger on the gloves. Another suggestion would be to work a dec or two on the last few rounds if you desire a tightly finger opening. Sc in ea st evenly around thumb. Sc in ea st tightly and end final rnd with a Sl St. I did not need to work any decreases on the thumb I crocheted for this pair of gloves but I did crochet the last two rounds very tightly so my thumb fit was snug. The thumb fit was perfect for my husband who wears large to extra large gloves. The thumb length for the gloves in this pattern was 1-1/2 inches long. Very nice and masculine. I like the simplicity of them, which makes them more agreeable with the masculine gender. These are great. Found this on Crochetville and had to check out the pattern. I like the color you choice too. I like the color and the design. I will try to make also for my partner. I’ll follow your instructions. I hope i will get this right. My friends who are snowmobile riders love these under their large winter mittens they use when riding. Often they need to slip mittens off to do something on the snowmachines, or eat, etc. But then their entire hands get cold. So these warm fingerless gloves work like magic for them. I make the arm area longer so they protect the wrist and up the arm under their parkas. Have a good demand for them in the fall. And the riders love that they can be machine washed and dried. I will use your pattern from now on and they will all appreciate it. Thank you for sharing. @Lauren – The main body of the gloves have a gauge of 4 sts across=1 inch; 5 rows=1 inch. The cuff is 5 sts across=1 inch. I crochet pretty tightly too so hopefully this will be about the right size for you. I am working this pattern right now for my dh. I crochet tightly and find a K hook is working okay for me. So far so good and I think he will like them. I stumbled upon your site via crochetpatterncentral. Thanks for the pattern. It looks to be a good one for simple yet warm and fashionable ‘glovies’. I wear these ‘glovies’ all year ’round here in the SF Bay Area where winter and Labor Day are our seasons it seems some years altho that is a Mediterranean winter I speak of. I am learning to knit with circular needles and hope someday to be able to recreate the ease of crochet with knitting. Not holding my breath however. Great pattern! So good to see a pair of fingerless gloves my husband would actually wear! I shared a link to the pattern on my blog this morning. I am having a tough time with the cuff… it says it should be 4″ in length and mine is at about 6″ and I have to pull it tight to get it to fit on my wirst. I tend to crochet tight, so I suppose I am wondering if I measure the wrist I am making the gloves for, would that give me an idea of how long to make the cuff? Sorry for the confusion, I have only done beanies so far. 🙂 thank you. @Janice – My cuff length was 4 inches long. I sent you an email with more info and please email me back if I can help further. LOVE these! I have made 3 pair so far for hubby and 2 grown sons, all of whom work indoors/outdoors, and still have 2 more pair to go before Christmas. I’m working the pattern exactly as written using Wool-Ease worsted weight (80% acrylic/20% wool) and size hooks specified, and they fit my average-sized guys perfectly. Thank you so much for sharing this free pattern. Merry Christmas! @Diane — So glad you enjoyed the pattern and the fit was just right. Best wishes and Merry Christmas! Thank you for this pattern. Was looking for a quick work up for our Postman. He is such a nice person. Last year I gave him some cologne. This year I wanted to do something different. And it just so happened to turn cold here in Louisiana, in the week of Christmas. I gave it to him early so he can be warm while delivering mail. I also crocheted a hat to go with the fingerless gloves. These gloves give him more mobility to work, and will keep him warm too. Yet still give a little breather too. Since our cold weather is not like most. We often get warm weather in the cold…if that makes any scence. Thanks again. So love these. Cheryl – So glad you enjoyed the pattern and were able to give a nice handmade present to your Postman. Best wishes and Merry Christmas!